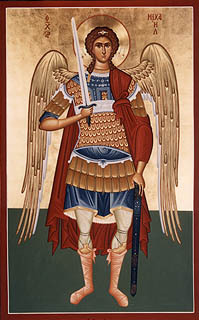 A typical Russian icon of the Archangel Michael. The Holy Archangel Michael is one of the most celebrated of the Angels and bodiless powers; he is called the Archistrategos, or chief commander, of all the bodiless powers. According to Holy Scripture and Tradition, he has interceded for humanity multiple times and continues to serve as the Defender of the Faith. St Michael is most often invoked for protection from invasion by enemies and from civil war, and for the defeat of adversaries on the field of battle. He is celebrated primarily on November 8, the Synaxis of Michael and all the Bodiless Powers of Heaven; September 6 also marks the miracle of the Archangel at Colossae. The name Michael means "like unto God" or "Who is like unto God?" Michael first appears in the Old Testament in the book of Joshua's account of the fall of Jericho. Though Michael is not mentioned by name in the text, it is said that Joshua "looked up and saw a man standing in front of him with a drawn sword in his hand." When the still unaware Joshua asks which side of the fight the Archangel is on, Michael responds, "neither...but as commander of the army of the Lord I have now come" (Joshua 5:13-14)1. The Church Fathers also ascribe to Michael the following events: During the Exodus of the Israelites from Egypt he went before them in the form of a pillar of cloud by day and a pillar of fire by night; the power of the great Chief Commander of God was manifest in the annihilation of the 185 thousand soldiers of the Assyrian emperor Sennacherib (4/2 Kings 19:35); also in the smiting of the impious leader Heliodorus (2 Macc. 3: 24-26); and in the protection of the Three Holy Youths: Ananias, Azarias and Misail, thrown into the fiery furnace for their refusal to worship an idol (Dan 3:22-25). Through the will of God, the Chief Commander Michael transported the Prophet Habbakuk (December 2) from Judea to Babylon, to give food to Daniel in the lions' den (Dan. 14:33-37). The Archangel Michael disputed with the devil over the body of the holy Prophet Moses (Jude 1:9). There are three icons of the Archangel Michael that he has personally intervened miraculously to the "authoring" of his image; Mantamados, Panormitis and Nenita. Each of these icons are different. Michael is also represented in icons as standing on a horizontal body and with his left arm held high, holding a small image of a "baby". The body represents a human being at the time of his death and the image of the "baby" represents the soul of the deceased. This icon came about since the belief has always been held that the Archangel Michael takes the souls of the dead with the Guardian Angel. This is typical of the miraculous and wonder-working Panormitis icon in Symi of Greece. There is only one 'icon' in the Orthodox church tradition that defies the traditional structure of iconography. This is the icon of Mantamados that exists in Mytilene, Lesvos. Here his upper-torso is represented as a three-dimensional image mixed with dirt and blood of martyrs and he is a warrior. His face is alive and he will mirror the condition of your soul by the expression on his face. 1 Scripture taken from the HOLY BIBLE, NEW INTERNATIONAL VERSION®. Copyright © 1973, 1978, 1984 International Bible Society. Used by permission of Zondervan. All rights reserved. ↑ Inside the orb are often the superimposed greek letters X P. The "Chi Rho" symbol for Jesus Christ. Thus the orb carried by the archangel belongs to Christ and represents the kingdom of the enthroned Divine King. This page was last edited on December 18, 2008, at 03:43. This page has been accessed 192,792 times.